Green Clay Goodloe, Brigadier General, United States Marine Corps Paymaster, was born at Castle Union, Madison County, Kentucky, January 31, 1845, on plantation of grandfather, Colonel J. Speed Smith, son of General D. S. Goodloe and Sally Clay Smith. He was educated in the classics and the law at Translyvania University, Lexington, Kentucky. He belongs to family which has maintained leading place in Kentucky for generations by distinction achieved by its members in civil and military positions. His ancestors were officers in patriotic army of the Revolution. His great-grandfather, Green Clay, served in Wars of Revolution and 1812. A noted achievement was marching a force to relief of General William Henry Harrison, besieged by superior force of British and Indians, at Fort Meigs, on the Maumee. General Harrison placed him in command of 3,000 men. His Grandfather, Colonel John Speed Smith, was aide to General William Henry Harrison in War of 1812, Speaker of the Kentucky House of Representatives, and a Member of Congress. An uncle is the veteran General Cassius M. Clay, a Captain in the Mexican War, wounded and taken prisoner, pioneer in abolishing slavery, a Major General in Army of the United States, and Minister to Russia. Another uncle is Major General Green Clay Smith, United States Volunteers, shot in the knee in a cavalry charge at Lebanon, Tennessee, a veteran of the Mexican War, a Member of Congress, and Governor. When the war became imminent, his family threw their powerful influence on the side of the Union, and no one thing did more to hold the State, which wavered, true to her allegiance. Major Goodloe, then a boy of 16 actuated by the soldierly traditions of his family, was then a member of the Lexington Chasseurs, which was loyal to the flag. Major Goodloe was a marker in the company, and carried the American flag the last time it appeared in a parade of the Old Kentucky State Guard. He was ordered by Colonel R. W. Hanson, the Colonel in command, to take it to the armory, and this precipitated the dissension which drew a sharp line between the Union and secession portion of the Guard, and broke it up. Major Goodloe, with the rest of his family, became active on the side of the Union, and he, with one other and a brother, were the first to arrive, armed with muskets, at a depot, in Lexington, when it seemed inevitable that a fight must be made to secure for the troops the arms which had been sent them by government. He joined the 4th Kentucky Cavalry Regiment, which he reached at Wartrace, Tennessee, as it stood in line of battle to receive the attack of the enemy. Was in ten cavalry battles and skirmishes during his service. For his gallant conduct at battle of Lebanon, Tennsee, General Dumont recommended his promotion, while still on field, to First Lieutenant. When promoted he was assigned to Company I, 23rd Kentucky Infantry, and detailed as aide-de-camp on staff of General Green Clay Smith. He served in this capacity on Brigade and Division staffs during the campaign through Kentucky and Tennesee, participating in many engagements. At the cavalry battle of Little Hatpeth, Forrest's men completely surrounded and cut him off, but he broke through them. Johnson's report says, "Lieutenant Clay Goodloe, of General Smith's staff, in returning from delivering an order, found himself surrounded by rebels, and had to run the gauntlet. After emptying his holster pistols, laid flat on his horse, relying upon his spurs and his 'Lexington.' They brought him safely home, but he has a bullet-hole through his pants to remind him of amiable intentions of his Southern brethren respecting himself." In the thorough rout of Morgan's Cavalry command, on May 4, 1862, at Lebanon, Tennessee, Surgeon Adams reported, "Clay Goodloe kept in line with Colonel Smith, and was grazed on the third joint of the second finger by a bullet. He attempted to hold poor Piercefield on his horse after he received his fatal shot. He is a gallant and noble boy, yet beardless, but has the courage of a veteran." Every official report contained flattering mention of him. In September 1863, he was appointed a cadet at West Point, but resigned in 1865. He was commissioned Second Lieuenant, USMC, April 21, 1869, was promoted to First Lieutenant, January 12, 1876, and was made Paymaster, March 17, 1877. He married, on April 17, 1877, Miss Bettie Beck, the daughter of U.S. Senator James Burnie Beck and Jane Washington Thornton. His wife is a great-great-great-niece of General George Washington, being related on both sides of her mother to the Father of our Country. 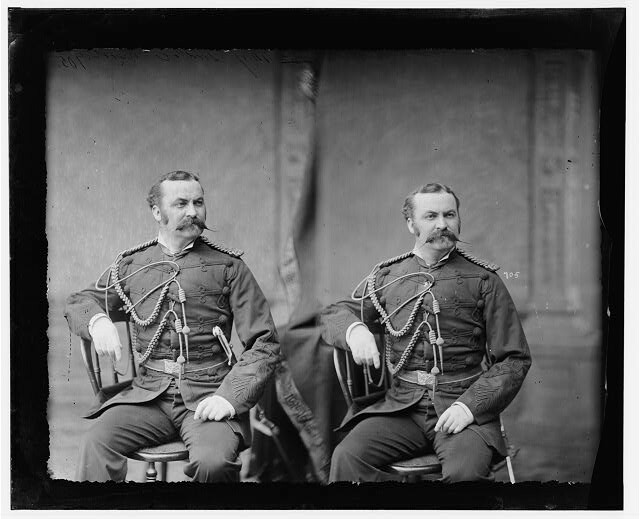 (Officers of the Army and the Navy) who served in The Civil War. Edited by Major William H. Powell, US Army, and Medical Director Edward Shippen, US Navy. Published in 1892. Bettie Beck Goodloe, wife of Green Clay Goodloe (1859-1942). They are buried together in Section 2 of Arlington National Cemetery. 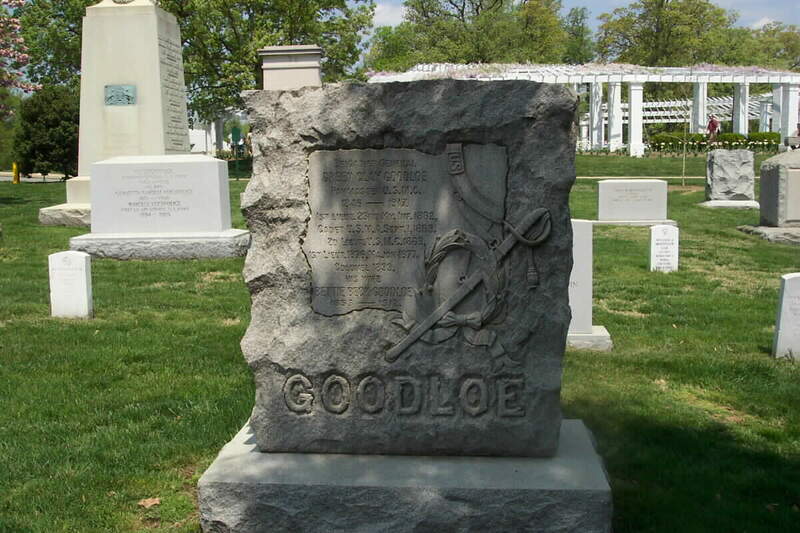 General Goodloe was a member of the Virginia Society of the Order of the Cincinnati; The Loyal Legion (commander in 1913-1914); the Grand Army of the Republic, Kit Carson Post, and the Army of the Cumberland. He was a member of the Sons of the Revolution in the District of Columbia for twenty-seven years serving as its President for the year 1899. General Goodloe’s first wife was Betty Buckner Beck, daughter of United States Senator James Burnie Beck, of Kentucky. He is survived by his second wife, who was Marian Campbell Johnson, and one son, Green Clay Goodloe, Jr.